Equipped with four 20mm Citizen Swiss Screw machines and three 32mm Citizen Swiss Screw machines, we can create small but critical machined metal and engineered plastic parts for the aerospace, commercial, and medical manufacturing industries. Swiss screw machining and turning comprises a large part of our high precision machining business at Ardel Engineering and Manufacturing. Swiss Screw Machines are different from other types of CNC Lathes or turning machines because they minimize the distance between the workpiece support (main spindle) and the cutting tool through the use of a guide bushing. This contrast from traditional turning reduces workpiece bending, thereby eliminating deflection at the cutting surface. The Swiss machining process is ideal for precisely manufacturing high volumes of small cylindrical pieces. At Ardel, we can accommodate parts made from almost any type of metal, plastic, or engineering grade material up to 32mm (1.25 inches) in diameter. The magazine style bar feeders of our Swiss CNC lathe machines allow continuous operation and efficiency by holding raw rod stock up to 12’ in length. The twin spindles of our machines also enable versatile secondary operations to create multiple part features within the same cycle. Ardel Swiss machine tooling is optimal and economical for producing components in quantities between 500 and 50,000 units, though our team can also produce orders above or below this range. Our highly experienced engineers will work with customers to advise them on the best manufacturing method for their specific application and the particular geometry of their part. 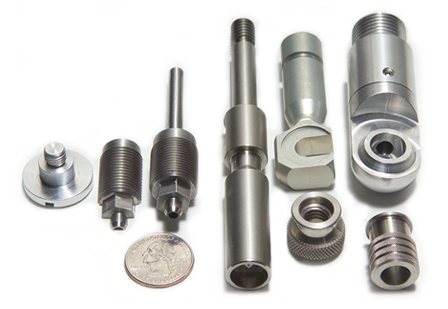 We believe that screw machine companies should offer turnkey solutions to customers, as well as built-to-order, high precision parts. At Ardel, we work with certified subcontracted vendors in a number of secondary processes to ensure that you receive completed custom machined parts with the exact specifications you need. Ardel is proud to be ISO 9001:2008 certified and ISO 13485 compliant, allowing us to give customers complete confidence in our control over materials and processes. We use electronic communications across departments, from designs, to emails, to accounts payable; we have even become completely paperless with some customers. Our testimonials show that Ardel is a trusted partner who delivers quality and satisfaction on every job. To view diverse examples of previous precision Swiss screw machining design and manufacturing projects, and to get a better idea of Ardel’s Swiss type CNC lathe, materials, sizes, and process capabilities, please visit our machined parts gallery. For additional information about our machining capabilities and secondary processes, please review the specification table below or explore more details regarding our Swiss turning capabilities. 3 Citizen-Cincom A32 Type VII, M70 Control, Multi Spindle Swiss, 1.25" dia x 12.59", 9 Axis, CAV 332 Bar Feeder, 8,000 Spindle RPM, 50,000 RPM Live Milling.